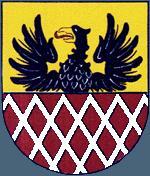 Cheb Town 1994: Flag: white over red, in the middle of the field the arms placed - per fess Or and Gules, in chief a Demi-eagle Sable beaked of the field, langued Gules, the base fretty Argent. (five and five rods). These are the arms from the 14th century, in colors of the 16th century, which were used since that time until 1961. In that year the Czechoslovakian (socialist) Demi-lion without "new" Slovakian escutcheon replaced the imperial (German) Eagle and nine linden leaves grown up of the rods in lower field. It was said to be a symbol of nine centuries of Cheb history. No data about the ratio (2:3 - I suppose). Cheb (German: Eger) is a town on the Ohře (Eger) river, once a border fortress - its fortifications were razed in 1809 -, now a great railway center. In the town-house Wallenstein was murdered (1634). The town was taken by the Swedes in 1631 and 1647, the French in 1742. Before the 2nd World War it was the center of Henlein's Sudeten German movement; it was transferred to Germany in 1938, and restored to Czechoslovakia after the war. Population: 40.000.
image from this website, spotted by Jarig Bakker, 3 Feb 2001.